Once you have completed the Horse Tricks hobby and built the vaulting arena (read my guide to the stables post for more information) an adult sim will be able to use a 2 star horse to begin this hobby. After the time has passed come back and click the exclamation mark above your sims head to find one of the ribbon collectibles. Every time your sim does the vaulting hobby your vaulting hobby skill level up percentage will increase, once you reach 100% you will level up, there are 6 levels. You need to reach level 6 to be able to unlock all of the ribbon collectibles, once unlocked you will be able to find them. Horseback Gymnast One Hand Fluke and The Saddleless Sally are now unlocked in the hobby collection. 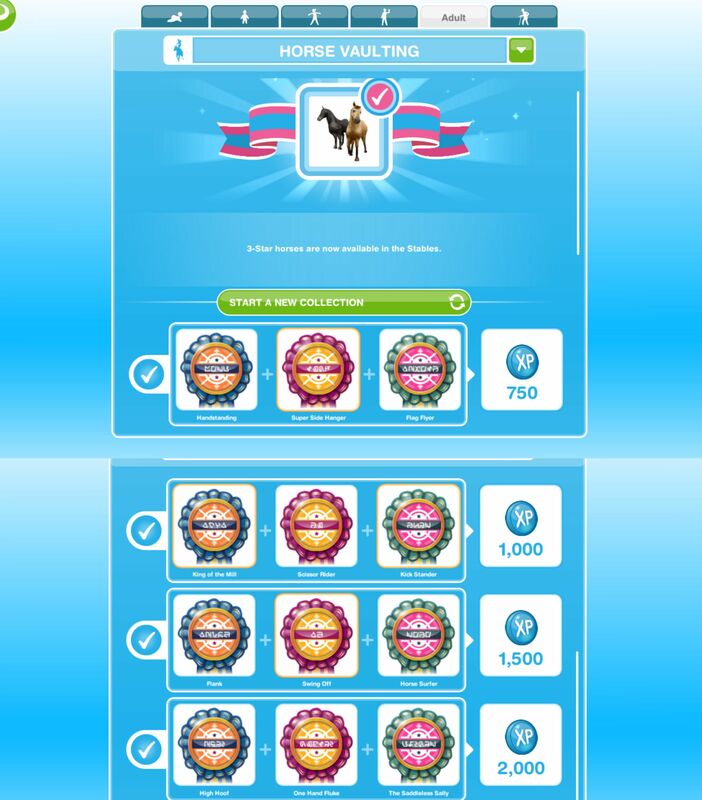 You will now also be able to use the 3 star horses to complete this hobby quicker! Hi when I try to buy a horse for vaulting it says I need to complete to tricks first. I have people on level 1 tricks how far do they need to get or is it about ribbons? Thanks! You need to get to level 6 so you can unlock all the ribbons, you need to get all the ribbons to unlock a 2 star horse so you can do the vaulting hobbby. Will all potential collectibles remain unlocked for future attempts to complete Tricks even if I move the same Sim over to Vaulting? I’m trying to decide if it is worth keeping one Sim at Level 6 on each horse hobby or okay to move them on. I only had the one Sim working on Tricks so if they change hobbies I won’t have anyone there on L6 if Horse Tricks factors into a timed hobby event in the future. In other words, does the game remember you’ve previously reached L6 and/or completed the hobby for future timed events, even if there is no one on L6 when the timed event starts. So far, I’ve been keeping at least one L6 on cooking, fashions, fitness, etc. since they come up repeatedly (or useful for points like cooking is). Is it worth it to do so, or does it not actually matter? If you previously reached level 6 with a sim and then you change their hobby the game will remember you reached level 6 so you don’t need to keep a sim on each hobby. Thanks, that is good to know. I feel better moving some more sims to cooking for LP or live hobby events like fashion or fitness, knowing that.